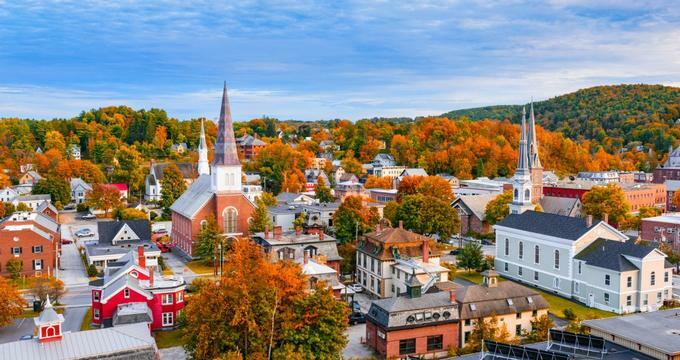 You can find an inn perfect for a romantic getaway in Vermont, whether you would like to be surrounded by nature or within walking distance of city attractions. There are even pet-friendly options available. Regardless of the type of inn you would like to stay in, you should be able to find it for your Vermont getaway. 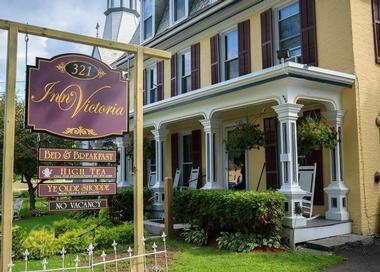 The Inn Victoria is a historic bed and breakfast along the Green in Chester, offering a relaxing getaway by Okemo Mountain. The building dates back to 1851, but it is filled with modern conveniences. Each of the nine rooms and suites have air conditioning, flat-screen TVs, high-speed fiber optic cable, DVD players, iPhone sound systems with clocks, and antique furniture. Rooms also have private baths with plush Turkish towels and robes, and some even have claw-foot tubs for two, Jacuzzi tubs, or showers for two. The Golden Stage Inn delivers the comforts of home in a space made for relaxation with warm, friendly hosts and easy access to outdoor and artistic attractions. 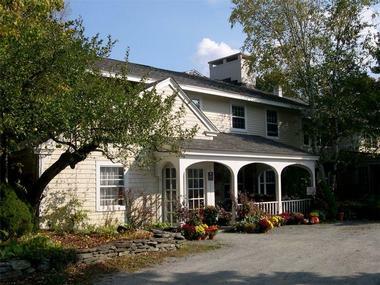 This inn is situated in the heart of Okemo Valley, and it was originally a stagecoach stop built in 1788. The building has historic country charm with modern amenities. There are six standard rooms for two people and two family suites for four or five people, each with private bathrooms and showers. One even has an extra-long jetted tub. Some also have TVs, fireplaces, sitting areas, heated tiles in the bathroom, and private porches. Inside, you will find common rooms with books, Wi-Fi, and fireplaces. Guests can explore five acres of fruit trees, gardens, and grassy lawn plus the horseshoe pit and in-ground pool. There are also free-range hens and sheep on the property as well as honeybee hives. The daily breakfast features as many organic, locally grown ingredients as possible and includes fresh fruit, fresh baked scones or muffins, yogurt with fresh honey, and eggs from the chickens. There is also a Bottomless Cookie Jar, and every weekend, you can get a slice of the Saturday Night Chocolate Cake. Depending on the weather, there is hot apple cider and homemade soup with bread. 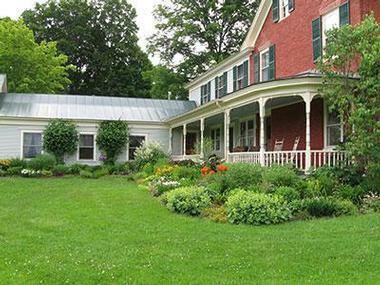 This boutique hotel sits inside a recently updated farm house built in 1777. Guests can stay in one of the ten rooms or four suites, all of which have modern amenities. Every room has a private bathroom, in-room heat control, central air-conditioning, wireless internet, and cable TV, along with unique appointments. The bathrooms include Beekman 1802 goat milk toiletries and hair dryers, and guests can borrow an iron with ironing board. Rooms feature a queen or king bed and may have shower tub combinations or just showers. Some also have a 40-inch flat-screen TV, small sitting area, two-person whirlpool tub, two bedrooms, private decks, a living room, and/or a pullout sofa. Guests can enjoy a meal at the Fireside Restaurant with its rotating menu based on what is in season. Breakfast is included in your stay with a main dish like French toast, Croque Madame, or breakfast panna cotta, and fresh coffee is available starting at 7 in the morning. Back Inn Time is a Victorian Manor built during 1858 that has since been lovingly restored. There are three smaller guest rooms with full or queen beds and private baths and two master rooms with fireplaces as well. The private baths may be ensuite or directly outside the rooms, and the rooms always have European down comforters, luxury microfiber sheets, air conditioning, and Wi-Fi. Those traveling in groups may prefer to stay in The Loft with its two large family/living rooms, large master bedroom, second bedroom, full kitchen, and bathroom. There are four porches to enjoy the outdoors, or guests can sit inside in the living room. There are also two sitting rooms where you can relax. Guests also have access to off-street parking. The full breakfast can be served in the inn’s formal dining room, on the sunny deck, or in the casual café area. The inn’s bar served local wine, beer, and cider. Those who want more from their stay can opt for a package with things like a massage. There is also the option to make a dinner reservation in the formal dining room, and there are catering options. 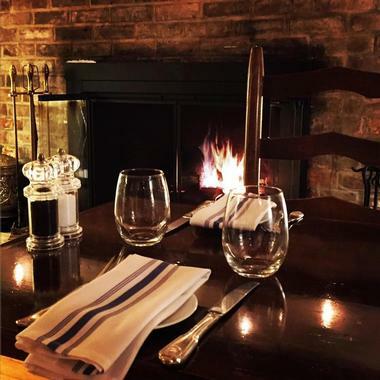 This New England getaway offers luxurious and romantic rooms perfect for relaxing or spending some quality time with your partner. Each of the ten guest rooms has its own theme and style along with amenities like wireless internet, an in-room phone, a clock/radio/CD player, air conditioning, and slim-line digital flat-screen TVs. There are also hair dryers, luxurious bath lights, thick oversized towels, candlelight for Jacuzzis, night lights, wine glasses and corkscrews, non-allergenic comforters and pillows, Pharmacopia All Natural toiletries, and extra-firm Posturepedic mattresses. You can also opt for a room with a DVD player, Apple TV, iPod docking station, mini stereo, private deck, wood-burning fireplace, private fridge, and/or two-person steam-sauna. The living room has a fireplace, hand-hewn beams, a sofa, and relaxing chairs, and the Gathering Room has the biggest fireplace, bookshelves, wingback chairs, and music. The back porch and grounds have excellent views of the Green Mountains and more. Enjoy breakfast in the Conservatory with a hot beverage, fruit, fresh baked bread, and a main course made with local ingredients. Most food restrictions can be accommodated. 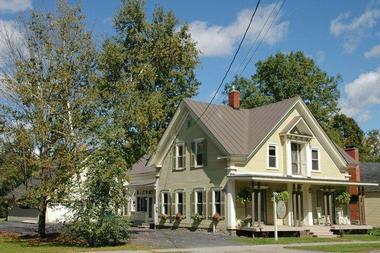 This is the only full-service country inn in Middlebury, and it is conveniently close to the village center. The federal style building was built in 1814. Each of the 20 guest rooms has a private bath, individual air conditioning and heating, phones, and satellite TV along with modern amenities and a historic feel. Many rooms also have sitting areas, private decks, gas or wood fireplaces, and jetted tubs. The largest rooms are in the Carriage House, and six of them have king beds, fireplaces, coffeemakers, and two-person jetted tubs. The Gate House has a full wraparound porch and five rooms. The inn’s historic buildings have four acres of gardens and lawn around them, perfect for a relaxing stroll. Relax by the fireplace inside or on the deck. The complimentary full breakfast includes a cold buffet and made-to-order sweet or savory entrees. Later on, you can get a drink and snack in the cozy bar or have a meal at Jessica’s Restaurant. Guests also receive a day pass to the local Middlebury Fitness Club right by the inn. This inn is located right in Woodstock and offers spacious rooms perfect for a getaway. Guests can stay in one of the nine different guestrooms, all of which have a TV with DVD player and a CD player. One room has an upgraded flat screen TV and Bose sound. Most rooms have king beds, although some have two doubles and one has a queen. They all have at least a shower, and most have tubs as well. Some even have two tubs or an air bath. Rooms also have soft or firm pillows, air conditioning, hair dryers, organic soaps, luxurious bathrobes, organic duvets, Turkish cotton towels, free wireless internet, and fresh flowers plus complimentary sweets and music CDs. Some also have claw-foot tubs or hand-made river stone baths with rain showers. Guests can borrow one of the many DVDs that the inn has to watch in their room or visit the inn’s extensive library. There is an English summer garden outdoors and a 24-hour guest refreshment station. Guests get to choose which hot entrée they would like in the morning, and it also includes fruit compote, seasonal produce, homemade muesli, jams, organic coffee, and more. The farmhouse at Fitch Hill Inn dates back to the late 1700s when it was first built as a home for the Fitch family on a 100-acre farm. Today, the inn has more than three acres of land on a residential property that is quiet yet easy to access from local highways. There are four guest rooms along with two suites with one room, all of which have modern amenities. Every room has views of the gardens, woods, and/or Green Mountains and private ensuite baths. The suites also add butler’s kitchens, fireplaces, and whirlpool tubs. You can also expect amenities like sleigh beds, TVs with DVD players, in-room phones, ceiling fans, coffeemakers, small fridges, microwaves, garden tables, and twin, queen, or king beds along with touches like Vermont-made quilts. Rooms also have air conditioning, irons, and hair dryers. Guests have access to wireless internet, off-street parking, a telephone, corkscrews, wine glasses, and robes. You can choose what time to eat breakfast, and the inn is able to accommodate food allergies and dietary restrictions. It includes fresh baked goods, tea, coffee, and juice, a fruit course, and a main course that is sweet or savory. 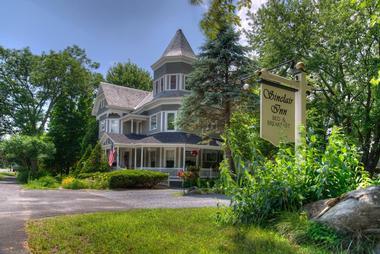 The Inn at Weathersfield has twelve guest rooms each with its own style, including luxurious, cozy, and rustic themes. You can opt for a queen or king bed, and every room has a private bathroom, free wireless internet, Direct TV featuring sports channels, DVD players, fine linens, plush robes, and Turkish towels. Most have air conditioning and fireplaces, and some also have docking stations, flat-screen TVs, two-person showers, whirlpool baths, access to a private rooftop deck, heated bathroom floors, towel warmers, and/or claw foot tubs. The property covers 21 acres, so there is plenty to do and explore. A three-course hot breakfast is made to order from the menu and included in every stay. You can choose from fruit and yogurt parfait, eggs, an egg veggie scramble with bacon or maple sausage, or the chef’s choice, and you can always have juice and a smoothie or fresh fruit. Guests will also find seasonal beverages in the tavern and fresh baked cookies in their rooms. Unless you choose to buy out the entire inn, guests must be at least 14 years old. 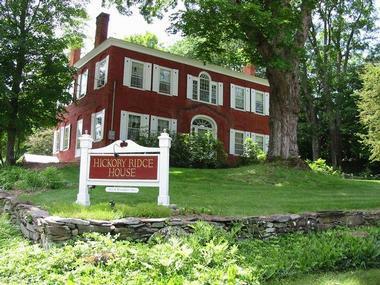 The Eddington House Inn is a boutique bed and breakfast right in North Bennington Village providing a scenic setting for guests. The building was constructed in 1857, and it has been elegantly restored to include three suites with private bathrooms and lots of natural light. The queen-sized beds have 100 percent cotton linens, separate sitting areas, renovated private baths, hair dryers, electric fireplaces, wireless internet, Vermont-made truffles at turn down, air conditioning, and windows with a view. Some also have TVs, daybeds, claw foot tubs, floor to ceiling windows, and double walk-in showers featuring dual shower heads. The inn also has beautiful gardens where guests can relax. Guests can make the most of their stay with one of the eleven different packages that include things like romance, golf, bicycle, a girlfriend’s getaway, and skiing. 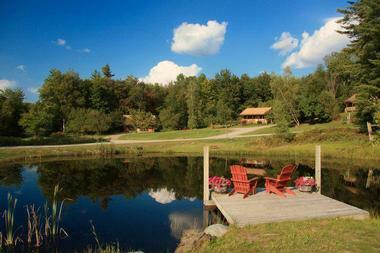 Sterling Ridge Resort is a log cabin resort at the end of a scenic back road. There are twenty-three log cabins along with three larger units for guests to stay in, offering privacy along with the comforts of home. Many of the cabins are dog friendly, and they all have country furnishings along with modern amenities such as a living room/dining area, fully equipped kitchen, cable TV with DVD player, woodstove, picnic table, fire pit, outdoor grill, and covered porch complete with Adirondack chairs. Linens are always included and there is a primary heat source in addition to the fireplace or wood stove in the living room. Cabins may have one, two, or three bedrooms, or they might be studio style. Some even have double Jacuzzi tubs. Larger groups will be interested in the Pond House with its two bathrooms and four bedrooms or Mansfield House with a spacious living area. The entire property covers 372 acres of land so there is no shortage of outdoor areas to explore and plenty of opportunities for privacy. This includes a 14-acre pond where you can walk, fish, or paddle. There are two full miles of trails on the property as well, including areas for snowshoeing and snowmobiling in winter. 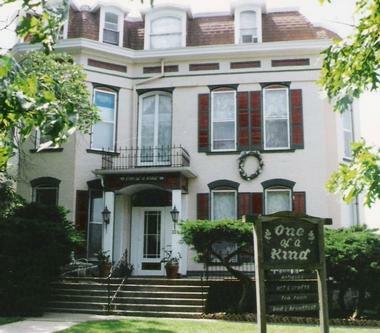 The Thistledown Inn provides all the comforts you expect from a bed and breakfast in an eco-friendly environment and a Victorian-era home. 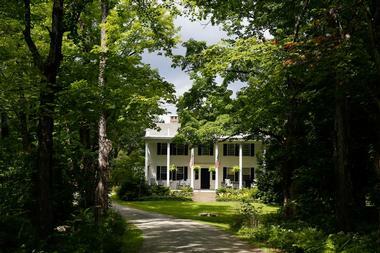 It is not only a historic home but is also accredited as a Vermont Green Establishment. 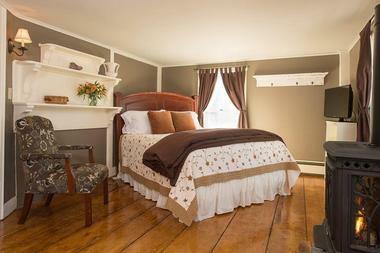 All of the guest rooms feature Vermont crafted furniture, and there is wireless internet. There are five guest rooms with features like air conditioning, TVs with Dish Network, sitting areas, ensuite or shared bathrooms, French doors, fireplaces, down pillows, down comforters, deluxe linens, canopy beds, ceiling fans, toiletries, hair dryers, cotton bathrobes, and access to an iron. The full complimentary breakfast is made using organic and local ingredients, including eggs, grain, dairy, meat, and fruit. Tea and coffee is ready before breakfast, and there is typically a fruit dish, fresh baked goods, and the main sweet or savory entrée. Guests also get chocolate truffles, home baked goods, and complimentary organic wines, beer, cider, and local cordials. 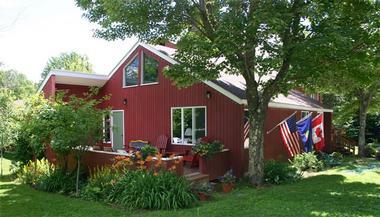 One of a Kind B&B prides itself on offering a big view in a little house. 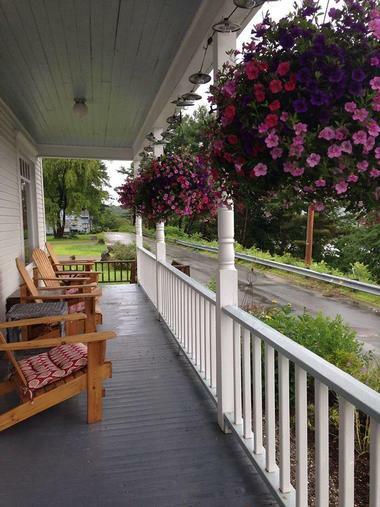 There are excellent views of Lake Champlain, and the bed and breakfast is in a quiet neighborhood. The two-room suite has a private bath or you can stay in the small separate cottage. The suite has a queen size bed, a sitting room and pantry, and a private bath with a tub and shower. The cottage has a fully equipped kitchen, a private bath, a full-size bed, radiant heat flooring, and the garden right outside the door. The property is air conditioned, but you can also open the windows to take advantage of lake breezes during the summer months. The backyard gardens have a table and chairs along with a tree swing. There is also free wireless internet and a friendly cat that lives there. The daily breakfast is self-catering and supplied to the cottage or suite. Expect things like yogurt, organic juice, home-roasted coffee, organic tea, whole milk, and granola with the option of changes for dietary restrictions. 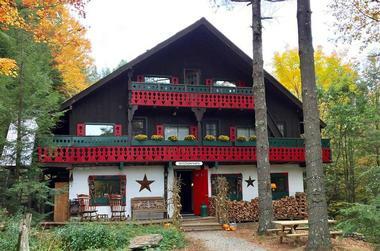 The White Horse Inn is conveniently located right by the entrance to the Sugarbush Mt. Ellen Ski Area with an altitude that lets you see far into the distance and appreciate your surroundings. The twenty-six rooms can accommodate over fifty guests in total, and every room has a bathroom and modern amenities. You will find local soaps in the bathroom and if you like them, you can even buy a large container. Pets are allowed on a case-by-case basis with advance notice. There is wireless internet and cable TV along with access to Netflix in the Fayston Game Room on the big-screen TV. There is also a conference room and a great room with a fireplace. Guests can enjoy Vermont wines and beers. Chef Allen prepares the morning breakfast, which includes things like Vermont cheddar cheese scrambled eggs, banana bread French toast, Vermont maple sausage, and more. There is always cereal, oatmeal, fruit, juice, yogurt, bread, and bagels along with Green Mountain Coffee and as many local Vermont products as possible. This historic brick farmhouse dates back to around 1810 and has an attached carriage house to provide nine guest rooms and multiple common areas. The rooms have antique plank floors, country quilts, Turkish cotton towels, private ensuite baths, luxurious bathrobes, luxury bed linens, toiletries by Gilchrest and Soames, hair dryers, air conditioning, and Lake Champlain chocolates. Some also have HD TVs with Blu-ray/DVD players, fireplaces, mountain views, sleeper sofas or day beds, whirlpool tubs, and snack stations. The dining room has garden views and private tables. The living room has a cozy fireplace, generous seating, and a baby grand piano, and the entire inn has Wi-Fi. There is a large-screen TV and DVD player for guests to use along with a game room packed with board games. The hot tub/spa is open all year round, and there are areas to play bocce and horseshoes along with outdoor eating. Guests have access to hot apple cider during fall and winter or iced tea and lemonade in spring and summer. The complimentary breakfast has three courses with breads, fruit, jams, juice, fresh-brewed coffee, tea, and a range of entrees. The afternoon tea features homemade pastries and cookies, and there is a guest fridge and microwave. 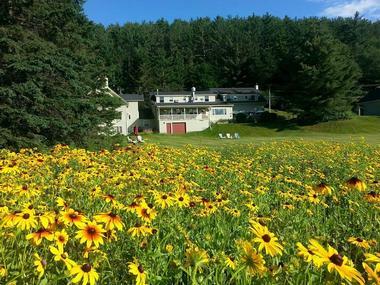 This peaceful inn is in West Dover, a historic village with views of Mount Snow Valley and Green Mountains. Each of the guestrooms has its own unique décor and the bathrooms have luxury robes and L’Occitane amenities. The thirteen rooms also have free wireless internet, CD players, luxury bed linens, and views of the mountains or gardens. Many rooms also have TVs with DVD players, fireplaces, private decks, and jetted tubs. Some even feature multiple widescreen TVs, two-person Jacuzzis, rainforest showers, sitting areas with sofas or sofa beds, and iPod docks. The inn has a pool surrounded by flowers for those who want to be outdoors. Inside, you will find the Dining and Sitting Rooms with log fires, sofas, armchairs, and views of the mountains along with a small library. There is also a bar for those who want a cocktail. Enjoy bottled Vermont water and house-baked cookies whenever you want. A complimentary breakfast begins the day, and guests can also choose to enjoy dinner in the Deerhill Inn Restaurant. This bed and breakfast by Burlington lets you enjoy the charm of an older time and pamper yourself with afternoon treats and delicious breakfasts. 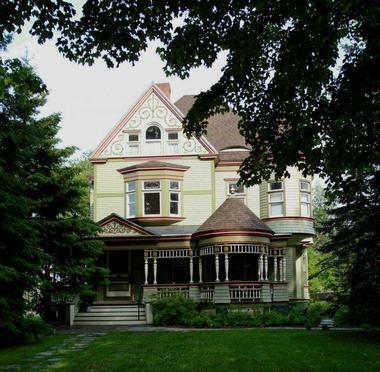 This 1890’s Painted Lady is located close to attractions such as opportunities for biking, hiking, and antiquing. There are six guest rooms with Direct TV, custom soap and shampoo, robes, hair dryers, slippers, duvets, Sealy Posturepedic mattresses, individual cooling and heating controls, and free wireless internet. Some also have king size beds, stained glass windows, comfortable chairs, and bathtubs in addition to showers in their private bathrooms. The exterior of the building features perennial gardens with a stone pond and even a cascading waterfall plus enough Adirondack chairs for guests to find a nice spot to relax. Or you can sit in the armchairs or sofa in the common room. There is a complimentary breakfast in the morning and fresh baked goods in the afternoon and evening. 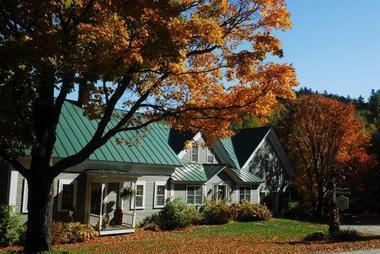 Grunberg Haus is a bed and breakfast with rooms in both an inn and cabins. Its location surrounded by trees offers privacy, though it is also conveniently close to ski resorts, biking and other outdoor activities, and breweries. There are rooms for as many as twenty-eight guests, and the rooms have shared or private bathrooms and the option of one or two queen-sized beds. Rooms may also have ensuite baths with king sized beds. Suites also add fridges, gas-fired woodstoves, private balconies, microwaves, fridges, and room for extra guests. The cabins have a sitting area with a wood stove, a deck, a vaulted ceiling, and microwave. The cabins are pet friendly and about a one or two-minute walk from the main building along a natural path. Every stay includes breakfast with fresh fruit, yogurt, granola, cereal, fresh baked bread, toast, juice, and a daily entrée. The Hickory Ridge House is a farmhouse in the 1808 federal style, and it is part of the National Register of Historic Places. It became an inn during the early 1980s, and there are eight spacious guest rooms, each of which has a private bathroom. Every room has air conditioning, premium toiletries, hotel quality linens, hair dryers, and cable TVs with DVD players. Some also have 10-foot ceilings, wing-back chairs, four-poster beds, walk-in showers, tubs, full kitchens, and fireplaces. Beautiful gardens surround the house, which is only a short walk from the local swimming hole, along with fresh water and numerous trails. Guests also have access to an iron, an internet terminal plus a printer or wireless internet if you bring your own device. There are guest refrigerators, complimentary snacks, and complimentary tea, coffee, and soft drinks 24/7. Those who plan on enjoying Sugarbush Ski Resort will appreciate the location of Beaver Pond Farm, which is just five minutes away, or you can just stay here and enjoy the amazing scenery. 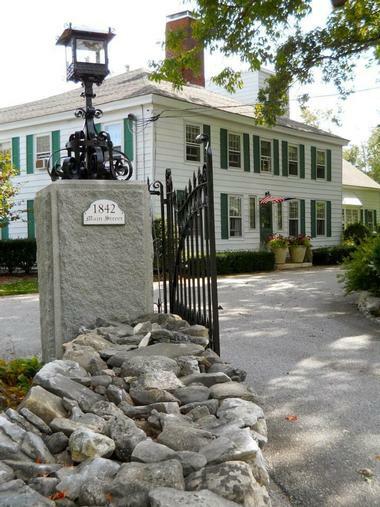 The farmhouse was built in the 1840s and has been updated to include modern amenities. You will find period antiques and exposed beams throughout the property. Rooms have king-sized beds, fine linens, fluffy down comforters, private ensuite bathrooms, hair dryers, internet access, comfortable spa robes, CD players and clock radios, and TVs with DVD players. You can also rent the entire four room home for larger gatherings and events. The crackling fire in the common room is perfect for warming up, or you can enjoy the open-air hot tub. You can also explore the five rolling acres of land on the farm, perfect for Nordic skiing and snowshoeing in the winter. There is an honor bar by the main dining room with wine and beer for guest convenience. The Harvest Barn Inn is the perfect place to relax and pamper yourself. 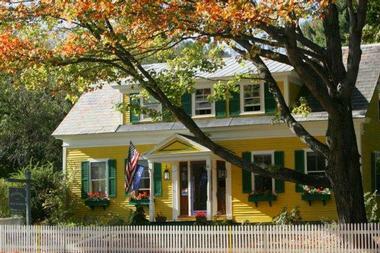 It has been a bed and breakfast since the 1980s but was built during the turn of the century. Every room has air conditioning and a private bathroom. The seven rooms all have their own décor and TVs. Some also feature private decks, gas fireplaces, full-size sleeper sofas, French doors, or double baths. You can sit by the trout pound and have a picnic there or go for a hike along a back trail. There are also Adirondack chairs and rockers on the front porch so you can just sit and view the natural wonders around you. Those who want to stay inside can enjoy comfortable seating in the common areas. Massages are also available, and wireless internet is accessible throughout the property. The evening features appetizers and homemade cookies, and in the morning, guests are treated to a farm-to-table breakfast. The barn is available for hosting events and has a gas-fired stove and hardwood floors. Hollister Hill Farm is a working farm with 205 acres that include productive hayfields, rolling pastures, peaceful forest, and sugar bush. The home site covers five acres and is where you will find the bed and breakfast within the 1825 federal style farmhouse and surrounding extensive gardens. There are two rooms and a family suite for guests to choose from. Rooms have queen-size beds and bathrooms with either a sauna or a fireplace. The family suite has two bedrooms and a bathroom, including multiple beds and a fireplace. Alternatively, there is a Little House with a full kitchen, TV, bathroom with tub and shower, washer and dryer, queen bed, pull-out couch, and wireless access, plus an outdoor garden with a picnic table and grill. 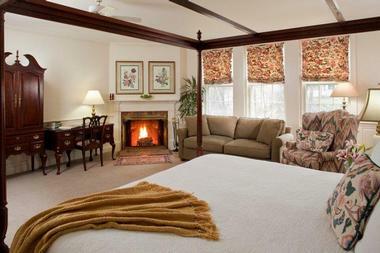 Guests can always relax in the common room with its cozy furnishings and fireplace. The small eating area has a small fridge and microwave for light snacks. There is no wireless internet or TV, but there is a radio and plenty of books, games, and puzzles. Guests can sit in the living room or out on the porch. There is also a pond for fishing and animals to visit in the barn. Forest trails start right next to the property. 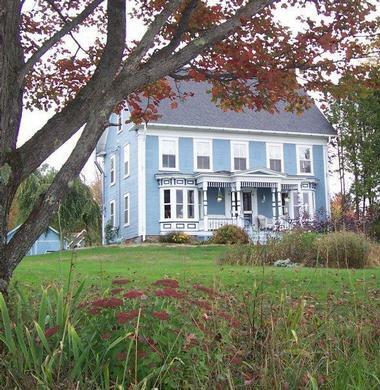 Whether traveling for pleasure or business, Estabrook House, a Victorian bed and breakfast, is perfect for relaxation. 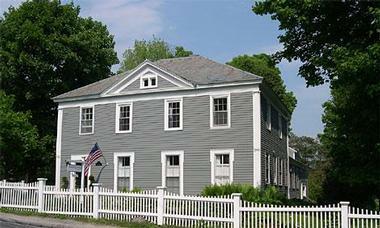 The National Historic Register home features modern amenities and five rooms, but the inn doesn’t book over six guests. You won’t find private televisions or phones, but there is complimentary wireless internet. Rooms have clock radios and irons upon request and Posturepedic mattresses, robes, and hairdryers. Some rooms also have private sitting areas, stained glass windows, Juliet balconies, and ensuite bathrooms. Guests can enjoy the library/media room, the living room, the enclosed porch on the second floor, and the wrap around front porch. There is a large number of books and games to borrow. Breakfast features fresh brewed coffee, a fruit starter, a bread basket with homemade baked goods like muffins or scones, jam, and a breakfast entrée. Dietary restrictions can be accommodated as well. The inn can also prepare a picnic lunch or serve a gourmet three-course dinner, each with 48 hours of notice. Coffee and tea is always available, and the afternoon can include a high tea time. The inn can even accommodate friends for these meals with notice and for a fee.